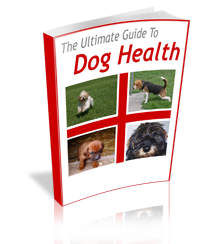 Share the post "Dog Skin Problems: How to Spot Them and Treat Them"
There are common dog skin problems a dog owner should be on the look out for. Many are easily treatable. Unfortunately, most dog owners run to the vet and spend $1,000 of unnecessary dollars. On the other hand, if you don’t know what the symptoms are, you could wait until the problem becomes major. This article will give you a list of common dog skin problems and some home remedies to treat them. For others listed, I’ll recommend a really great resource that will help you diagnose and treat your dog’s skin problems. Parasites cause a variety of skin problems dogs face. 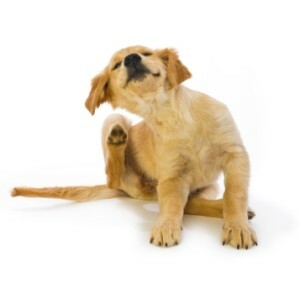 Fleas, ticks, and mites are responsible for itching, raised scabs, and hair loss. Mange is caused by a pesky parasitic mite that causes unusual shedding, bare patches, and scabs on the ears, head, and legs. Hair loss in an isolated area can be related to serious medical conditions so it’s important to check with the vet. Hot spots are one of the most common skin problems dogs have. This condition is generally caused by a bacterial imbalance. The most common symptoms are compulsive chewing, licking, and scratching the itchy and irritated area. 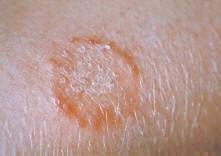 Hot spots appear as raw pink wounds and can lead to serious infections. Trimming the hair and cleansing the wound with a mild antiseptic or antibiotic cream is usually the preferred treatment. In severe cases, a cone collar will be recommended to allow the hot spots to heal. Acral lick dermatitis or lick granuloma are hot spots that form on the legs. Open wounds are usually related to external bacterial and fungal infections, but acral link has also been linked with psychological problems. To diagnose this skin condition, veterinarians will examine a skin sample to determine the treatment method. Ringworm infections form large scabby wounds on the fur and skin. 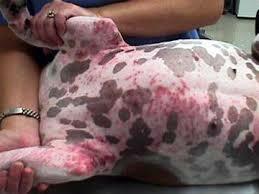 These infections look similar to skin problems dogs can contract, but they are dry and flakey not moist. Ringworm is a highly contagious infection caused by a fungus not a worm. This condition can be contracted by humans so it’s important for dogs to be treated with an antifungal medication right away to prevent the problem from spreading. Yeast infections are common skin problems dogs with long floppy ears tend to get. Symptoms of this condition include repetitive itching, foul odor, and a crusty yellowish substance in the ears. Fortunately, canine yeast infections are easy to treat with topical or oral medications prescribed by a veterinarian. Dermatitis can cause an irritating rash anywhere on a dog’s body. Dermatitis can be caused by a number of factors. If the problem seems ongoing, it could be related to a food allergy or an environmental source. Short term flare-ups could be caused by an allergy to a grooming shampoo or household product. The most serious rashes are treated with cortisone shots. Dogs get dandruff too. Dry flakes of skin are usually nothing to worry about. Problems with skin flakes are caused by low humidity or sensitivity to a shampoo product. Cut back on regular washings to see if the grooming products might be the cause. Seborrhea is one of the more serious skin problems dogs get. This condition is characterized by greasy fur and excessive clumps of flaking skin. Veterinarians can determine is the seborrhea is caused by a hormonal problem or another skin condition.